Rewards Canada sends our thoughts and prayers to everyone affected by today's devastating news from Brussels. The Platinum Card from American Express will be losing the Le Club accorhotels Platinum status benefit. If you haven't signed up for this offer yet be sure to do sot by April 15th and you'll get the status for another year. I just checked mine and it expires on April 30 so I believe, from the terminology below, that I will be automatically enrolled for another year. Effective April 30, 2016, enrollment in Le Club AccorHotels’ Platinum tier membership will no longer be a benefit on The Platinum Card. If your membership expires on, or after May 1, 2016, you’ll be able to retain your Platinum tier membership provided that you have met Le Club AccorHotels’ qualifying criteria. Depending on the number of nights stayed or points earned, Le Club AccorHotels will assess your membership and enroll you into the appropriate tier in accordance with Le Club AccorHotels terms and conditions available on www.accorhotels.com/leclub. If you are not yet a member, Le Club AccorHotels will offer you one (1) complimentary year of their Platinum tier membership if you enroll by April 15, 2016. At first this may not seem like a big loss seeing that Accor only has a few hotels in Canada and the U.S. except for those who travel to Europe and Asia where Accor has a bigger presence. But for those whom it may not seem like a big loss, it potentially is. Remember Accor is the chain that has bought Fairmont Hotels. Right now the two chains are separate but it may only be a year or so before we see Fairmont's President's Club integrated into Le Club accorhotels as Accor finishes the Fairmont takeover. Sure the Platinum cards gives a fast track to Fairmont Platinum status but once President's Club is gone the loss of the Accor benefit on the Platinum Amex means no more status at Fairmont Hotels. Here's what I would do, make sure you do take advantage of the Fairmont fast track from the Platinum Card this year as there is a good chance that Fairmont Platinum's will be extended Accor Platinum status when it is integrated. So in general, we should be safe for 2016 and 2017 but 2018 and on will be a loss unless other benefits (like the recent Hilton HHonors Gold) are brought to the Platinum Card. Over on our global site we have an exclusive offer running with HotelTonight! HotelTonight is an app that allows you to book last minute hotel stays at discounted rates. If you haven't used it before you can save US$25 on your first stay! Find out more here. Shoppers Optimum members can get 8,000 bonus points when you spend $30 or more tomorrow at Shoppers Drug Mart. Print the coupon here. 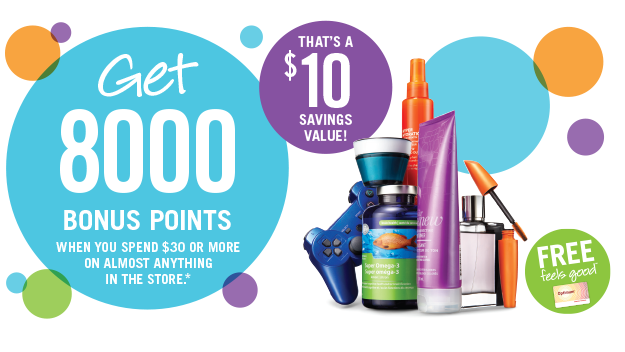 AIR MILES members can get 50 bonus Reward Miles when you spend $30 or more at Rexall until March 24th. Print the coupon here.